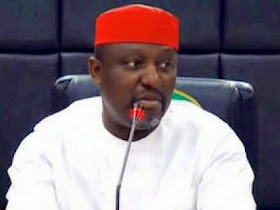 Governor Rochas Okorocha of Imo State on Saturday secured the mandate of his people to govern them for another four years as he won the governorship rerun election on the platform of the All Progressives Congress.Okorocha beat Deputy Speaker Emeka Ihedioha of the Peoples Democratic Party by polling 416,996 votes while Ihedioha 320,705.The Peoples Democratic Party governorship candidate in Abia, Dr. Okezie Ikpeazu, however, won by beating Dr. Alex Otti of the All Progressive Grand Alliance with 264,713 votes to 180,882. The PDP's Darius Ishaku of Taraba State was also coasting ahead of Sen. Aisha Alhassan of the APC going by the results that came in as at press time. For instance, in Kofar Sarki in Takum Local Government polling unit, the PDP had 588 votes against the APC's 7. At Suntai Daaji in Donga Local Government Area, the PDP got 1,139 against APC's 74. At Asibiti ward in Donga Local Government Area PDP scored 4,412 while APC had 604. The election which took place in no fewer than seven states only had governorship seats contested in the above named three states while other states like Kogi, Ekiti, Delta, Akwa Ibom, Cross River, Ebonyi, Gombe and Niger held elections for inconclusive seats in the state Houses of Assembly and the National Assembly. But the elections on Saturday were marred by voter apathy as most of the polling units in the affected states recorded low turnout of voters. In Imo State, our correspondent observed that voters at most of the areas designated for the election were scanty, as residents shunned the restriction of movement order by the Police. There were vehicular movements, while some shops opened for business. It was a similar situation in Irete and Orogwe Wards, where youths were engaged in sporting activities. Low turnout of voters was also recorded during the supplementary election in Ilejemeje Constituency in Ilejemeje Local Government Area of Ekiti State. The Independent National Electoral Commission had declared the election in the LGA inconclusive on April 11 after the cancellation of results from 22 units due to violence. Mrs. Cecelia Dada of the Peoples Democratic Party and the incumbent, Segun Erinle, of All Progressives Congress were the front runners in the election. The state Police Commissioner, Mr. Joshua Ibine, had deployed large contingent of policemen to the 22 units in Eda Oniyo, Iludun and Iye Ekiti, where the election took place. There was also deployment of soldiers and officers of the Department of State Service in the LGA. It was a similar situation in Abia State where low voter turn-out was witnessed during the supplementary election. The rerun was held in 299 polling units scattered across nine LGAs in the state, with a total of 175,537 voting population. In the election earlier held on April 11, the candidate of the ruling PDP, Dr. Okezie Ikpeazu, had polled 248, 459 votes, ahead of his All Progressives Grand Alliance counterpart, Dr. Alex Otti, who scored 165,406 votes out of the 439,454 total vote cast. INEC's Returning Officer, Professor Benjamin Ozumba, had declared the election inconclusive on the grounds that the 83,053 margin of lead was lower than the 175,532 total numbers of registered voters in the polling units where election did not hold or which results were cancelled. In some of the polling units monitored by our correspondent, accreditation of voters began as early as 8am without hitches as card readers functioned better than it was the case in the previous elections. However, at Umuobutu/Saint Silas Primary School, Old Umuahia, only 650 voters out of the 1265 registered voters in the centre were accredited. Similarly, at Umuezeala in Umuahia-South, only 152 out of the 650 registered voters at the polling unit were accredited. Voter turnout at the polling units was not impressive as of the time our correspondent visited. Reports from Ohafia and Umuahia-North LGAs, as well as other parts of the state, also indicated voter apathy. At Oloko Ward 1 in Ikwuano, the Minister of State for Defence, Col. Austin Akobundu (retd. ), commended INEC for the improvement recorded but stressed the need for a permanent solution to rampant cases of card reader failure in subsequent elections. Meanwhile, there was an unconfirmed report that some yet-to-be-identified thugs allegedly chased away voters at Mbom in Umuahia-North LGA. The state Commissioner of Police, Joshak Habila, did not pick calls made to him for confirmation. Reports also said the poll did not hold in Umunneochi LGA. An INEC source said its inclusion among LGAs for the rerun exercise was done in error. When contacted, the state REC, Professor Selina Oko, said, "There was no Form EC 40 G for the LGA which would show proof of the areas where election did not hold or was inconclusive to cause a rerun today." Oko also said reports of ballot box snatching later proved to be false after investigations by the Police. In Abia State, the supplementary elections witnessed an appreciable turnout of voters. The card readers deployed for accreditation of voters were reportedly functional, taking an average of two to three minutes to accredit a voter. Some of the voters expressed satisfaction with the process of accreditation, describing it as faster compared with the previous elections. Meanwhile, there were reports of violence in Mbom in Umuahia-North Local Government Area, where thugs allegedly attacked eligible voters. An agent of APGA, Mr. Obinna Abariukwu, told the News Agency of Nigeria that thugs invaded Isieke Ward. He said an unidentified voter, who was wounded by the thugs, had been taken to a hospital with the intervention of the security agents at the centre. The Police could not be reached for confirmation, as the Abia State Commissioner of Police, Mr. Joshak Habila, and the command's spokesman, Mr. Ezekiel Onyeke, did not pick calls made to them. The rerun elections for Delta-Central Senatorial District, Delta State, also witnessed low turnout of voters in many of the polling units. Some electoral officers, who spoke to journalists, decried the low level of participation by the electorate, in spite of the arrival of both personnel and materials as early as 8am. They, however, commended those who turned out for the exercise for conducting themselves in orderly manner. In an interview with journalists in Jesse, Ethiope-West Local Government Area, the APC candidate, Halims Agoda, said he had hope of victory in the election. He, however, expressed concern over alleged inducement of voters. Agoda called for additional research on use of the card reader, which he said was "not perfectly in order." The candidate of the PDP, Ighoyota Amori, described the election as "peaceful and favourable" to his party. Amori also attributed the poor turnout to cancellations recorded during the previous exercise on March 28. He said, "We don't blame the electorate because they have gone through two to three elections and are tired of coming out. The enthusiasm cannot be the same. "All the same, the PDP faithful came out and we are very hopeful. We are waiting to see the units that we will lose in this re-run. If big figures emerge, the INEC will be blamed."